Pfc. Ann B. Hammond, daughter of Mr. and Mrs. Carl Kaatz, attended school in Joliet, Ill.; wife of Bert Hammond. 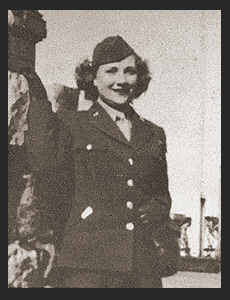 Entered Wacs in 1943, trained in Ft. Oglethorpe, Ga. and Camp Blanding, Fla.; served in England, France, and Germany. Awarded Good Conduct Medal, ETO Ribbon, Victory Ribbon.